Make a big impact, for less! With digital printing, you can cost-effectively print small quantities as the need arises, and get better response rates. to create a highly personalized direct mail campaign to each of your customers. realize cost savings for short run print projects. State-of-the-art color printers and presses deliver offset quality – featuring rich color, vibrant images, and sharp text – and enable high quality print-on-demand and personalization on a wide variety of materials, including magnets, clings, and plastics. Furthermore, smaller quantity, highly targeted communication pieces means less paper waste, which lessens your footprint on the environment. Marketers are often amazed at the waste attributed to collateral production. 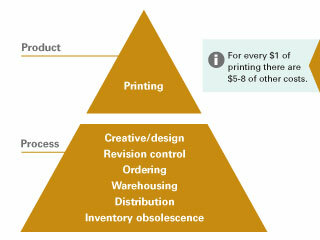 Industry estimates indicate that, for every dollar spent on printing, an incremental $5-8 is spent on related activities, such as general internal administrative costs, internal document preparation and review, internal and external creative costs, warehousing, archiving, fulfillment, and distribution. A large part of the extra expense is in the high cost of obsolescence. An extraordinary 31% of printed material goes to waste(1). It quickly becomes outdated and ultimately gets thrown out. I’m interested in Print-On-Demand with Digital Printing, please contact me!